HCL invites applications from young and energetic Indian Citizens for the post of ITI Trainees & Diploma Trainees. Hindustan Copper Limited (HCL) is a listed profit making vertically integrated, multi-Unit, Schedule-A Miniratna Central Public Sector Enterprise in the field of copper production. Its activities include mining, beneficiation, smelting, refining and production of finished copper products at units located in Jharkhand, Madhya Pradesh, Rajasthan, Maharashtra and Gujarat with the Corporate Office at Kolkata. HCL intends to engage ITI Trainees and Diploma Trainees for the copper manufacturing unit of HCL at Gujarat Copper Project, GIDC Jhagadia, Gujarat. Important Dates: Last date to reach the application is 27th May 2017. After successful completion of training, the ITI trainees would be absorbed in T-1 scale (15920-3%-29050) and Diploma trainees in T-3 scale (17380-3%-31810). On regularization, the posts, apart from Basic Pay, carry other attractive allowances as admissible to the regular employees of the company in non-Executive cadre. Trainee Grade 1(ITI Trainee) : Fulltime regular ITI course (NCVT/SCVT approved) in respective trade. Trainee Grade 2(Diploma Trainee) : Fulltime 3 years Diploma course in the respective branch of engineering recognized by Government/ AICTE.For Metallurgy discipline, candidates with B.Sc. (Hons.) in Physics or Chemistry may also apply. For Chemical discipline, candidates with B.Sc. (Hons.) in Chemistry may also apply. 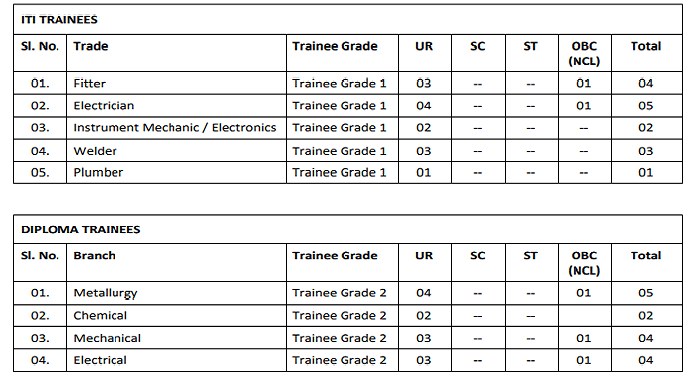 However, other conditions remaining same, candidates with Diploma Engineering will be given preference. The selection procedure for the above posts shall be through written test / trade test of the short-listed candidates. Written test for the above posts will be conducted at Bharuch (Gujarat) only. The mode to apply for these vacancies is offline.The eligible candidates may send their applications in the prescribed format appended to this notification complete in all respect, along with the Demand Draft, so as to reach the below address latest by 27th May 2017.The applicants are required to pay application fee of Rs. 250/- in the form of a Demand Draft in favour of Hindustan Copper Limited, Gujarat Copper Project payable at Ankleshwar. The name of the candidate and the applied post should be written on the back of the Demand Draft. Kindly go through the detailed Advt. No. : HCL/GCP/HR/Rectt/2017/303 before applying.